The aims of this study were to assess long-term impact of tooth eruption stages (ES) on sealant retention on occlusal surfaces previously coated with intermediary bonding layer and to determine caries prevention. Sixty-five school children were selected (aged 6–10 years), with four non-carious permanent first molar in different ES (OP (operculum present), ME (marginal edge), CE (completely erupted)). Split-mouth and single-blind study design was used. The teeth (260) were randomly selected according to treatment (sealant/technique): F (Fluroshield), H (Helioseal Clear Chroma), SF (Single Bond + F), EH (Excite + H). 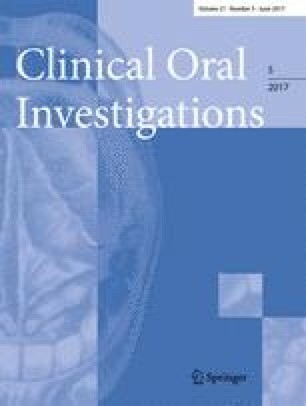 Sealant retention, marginal integrity, discoloration, and caries prevention were assessed after 6, 12, 18, and 24 months by calibrated examiner (Spearman = 0.91) using visual inspection. Data were submitted to the Cox proportional hazard model (survival analysis) and Likelihood ratio χ 2 test (correlation), p ≤ 0.05. At baseline, ES was 20 % in OP, 54 % in ME, and 26 % in CE. There was no significant difference on sealant retention between the treatments (p = 0.2774). However, significant differences were found regarding the ES on sealant retention (p = 0.0041). The CE stage showed the highest retention survival rate during the 24 months. The overall sealant prevention average was found to be about 99.4 % and showed no difference between the groups. Eruption stages affect sealant retention irregardless of the intermediate layer and type of sealant. However, there was caries prevention on tooth occlusal surfaces after 24 months, regardless of treatment. Sealing is recommended to prevent occlusal caries of newly erupted teeth in high-caries-risk patients. However, its application is critical on moisture limited control surfaces independently of sealer material and technique. Kelly Maria Silva Moreira and Kamila Rosamilia Kantovitz contributed equally. The authors are grateful to the Department of Pediatric Dentistry, State University of Campinas, Piracicaba Dental School. Specifically, our thanks extend to Mr. Norm Schiff for his cooperation and assistance in text editing and the Writing Area/General Coordination of the State University of Campinas-UNICAMP. This research was supported by CAPES–Coordination for the Improvement of Higher Education Personnel. This was supported by the Coordination for the Improvement of Higher Education Personnel (CAPES) in Piracicaba, São Paulo. This article does contain any studies with human participants performed by any of the authors. This clinical trial study was conducted after approval from the Ethics Committee of Piracicaba Dental School, State University of Campinas (protocol number 143/2003). For this type of study, formal consent is required. Thus, informed consent was obtained from all individual participants included in the study.